The 91st Academy Awards have concluded. The winners' names are out now. The ceremony was held without a host but a lot of presenters and performances. Best Song was given to 'Shallow' from A Star is Born. The artists Lady Gaga and Bradley Cooper also performed the song in front of the live audience together. And what a moving performance it was. It was certainly the best moment of the Oscars 2019. Lady Gaga won her first Oscar for Shallow from A Star Is Born. She gave an inspiring acceptance speech. “If you are at home, and you’re sitting on your couch and you are watching this right now, all I have to say is that this is hard work,” she said. “I’ve worked hard for a long time, and it’s not about winning. What it’s about is not giving up. If you have a dream, fight for it. It’s about discipline, over passion, and it’s not about how many time you get rejected or you fall down or you’re beaten up, it’s about how many times you stand up and are brave and keep on going.” Oscars 2019: Anne Hathaway Takes a Dig at Her Hosting Fail with James Franco as the 91st Academy Awards Kick-Starts without a Host. 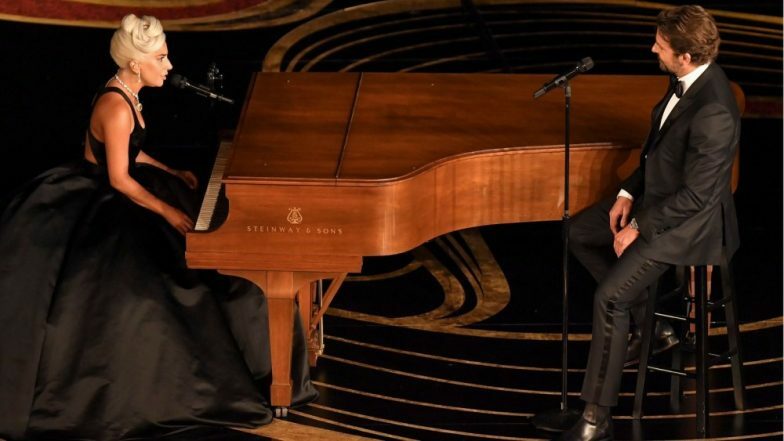 During their Oscars 2019 performance, Lady Gaga and Bradley Cooper remained in character. The star-crossed lovers from the film, A Star is Born. Love was in the air as they sang Shallow. Before this, the duo had given an impromptu performance on Shallow at a concert. Lady Gaga was performing at the concert and Bradley was simply attending. Gaga pulled her co-star on stage and insisted he sang. Bradley obliged and that was their first live performance together.